Inspired by historic factory and warehouse flooring, along with the use of reclaimed materials, Fineline® planks are made of hundreds of pieces of wood from various species cut to 1/8” strips carefully joined together in a random color pattern producing a distinct and dramatic appearance. This unique process may yield some minor voids which are factory filled. First introduced to the market over 20 years ago, we have recently refreshed this line with updated colors & matte finishes to offer a truly “Unique & Exclusive Collection” of hardwood floors. Extra Long 7’2” Fixed Length planks: Provides fewer seams while enhancing the look of the floor & making installation and maintenance easier. Dry-Sawn-Face 4 mm thick wear layer (5/8” skus) & 3 mm (17/32” sku): may be sanded & refinished up to 3 times. Eco-Friendly: By including wood fall off material created from the production of flooring, better utilization of the raw material is achieved. From previously unusable material, hundreds of pieces of wood from various species are cut to 1/8” strips then joined together to produce this very distinct look. Hevea core: harvested from trees used for the extraction of the sap to produce latex/rubber. After 25 yrs the sap dries up and the trees are then harvested. 1/8” strips of hardwood joined together to create a unique, urban, contemporary appearance. It’s all about the visual impact to any residential or commercial environment. Durable: end grain construction of the strips enhances the durability of the floor. True Square Edge milled to create nearly invisible joints for a custom “Sand & Finish” look without the time, dust and mess of a custom project. Similar visual to vertical grain bamboo with the stability & durability of hardwood & seamless appearance. 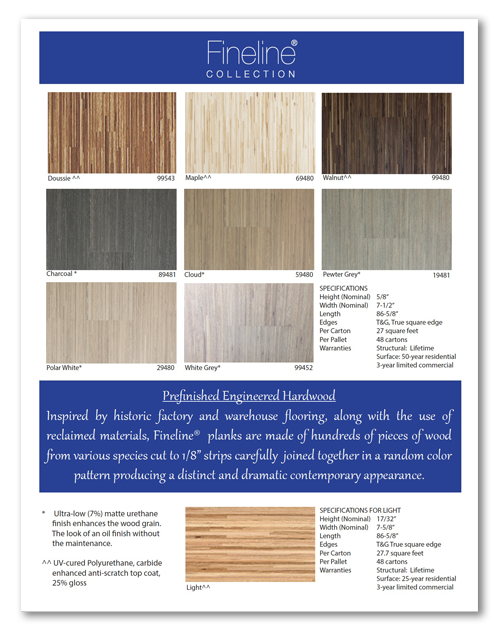 Dramatic color options: 5 new Fumed French White Oak options plus exotics & domestic species. **Commercial Wear Warranty must be pre-approved for application. All Fineline® products are CARB II and Lacey Act compliant. Charcoal, Cloud, Pewter Grey, Polar White, & white Grey: All French White Oak which is fumed to achieve the color variation. Very unique and enhanced durability due to the production process which uses the “end-grain”.